Choosing correct size Hormann and Garador sectional garage door. How to measure. The stated door sizes do not include the frame. Hormann and Garador sectional garage doors are almost always installed onto the rear surface of the brickwork aperture. They can also be fitted between brickwork and underneath the lintel of the garage opening. Please see both options explained below. 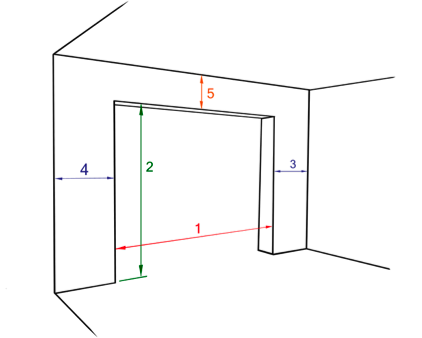 Minimum side room of 90 mm each side of the opening for the frame uprights, dimensions 3 and 4 in the diagram, view from inside. The stated door width and height does NOT include the frame. The stated door size is the INTERNAL frame size. Measure and send us these sizes for a quote. As a general rule the brick work opening should be the same width (dimension 1) and height (dimension 2) as the door ordered. These clearances must extend uninterrupted down the garage for ordering height plus 510mm as the tracks go into the garage this distance. For little extra cost Hormann will factory width or height cut a standard door to the sizes you require. Made to measure doors also available. 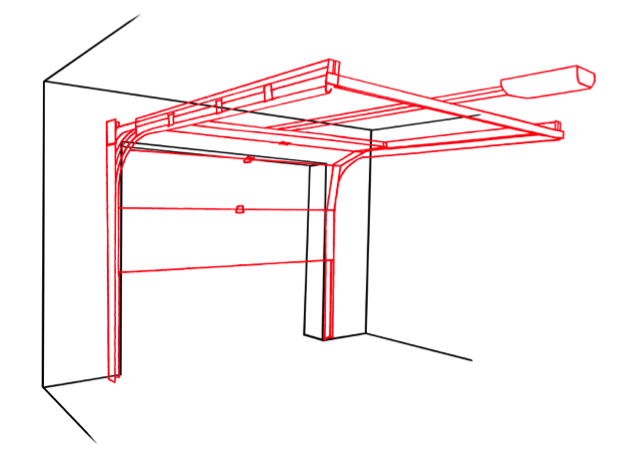 For example: a 10 ft (3048 mm) x 7 ft (2125 mm) Hormann sectional door fitted between brick and under the lintel will require:a brickwork width of 3048 mm door width + 90 mm frame on left + 90 mm frame on right plus 10 mm fitting clearance = 3238 mm required brickwork opening width. The finished floor to lintel height will need to be at least 2125 mm door height + 95 mm cross bar depth + 10 mm fitting tolerance = 2230 mm required brickwork opening height. 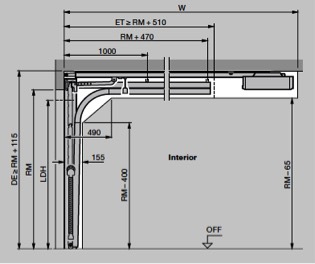 Hormann’s published sectional doors technical information. 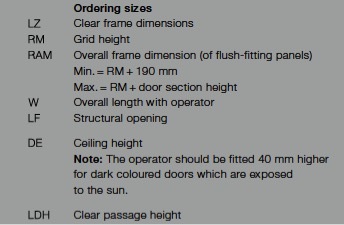 Technical specification of single sectional door upto 10ft wide. 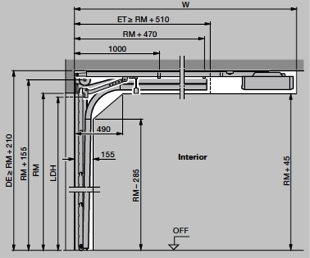 Technical specification of sectional doors over 10ft wide. 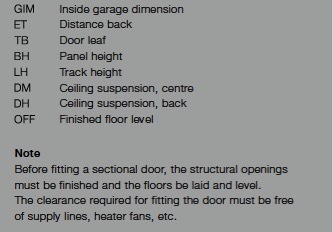 Technical specification of sectional doors over 10ft wide on L gear (Low headroom < 210mm headroom). Full explanation of abbreviations for all diagrams at the bottom of this page. 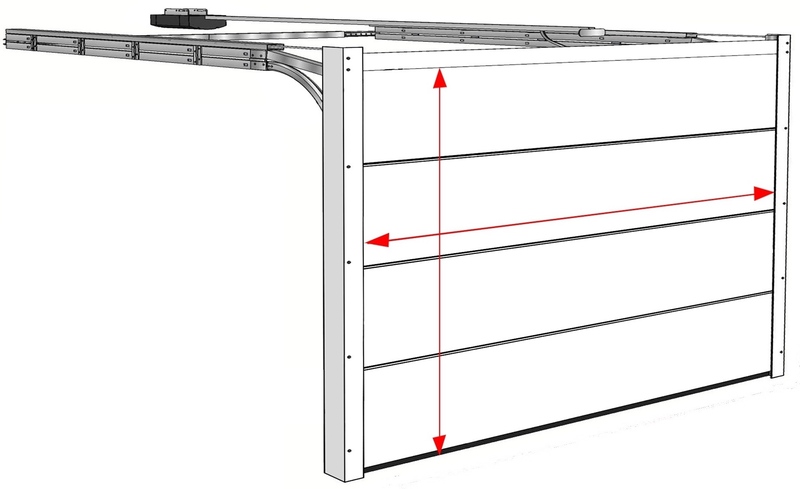 Hormann technical specification for a single sectional door UPTO 10ft wide. See explanation of diagram abbreviations at the bottom of page. on Z, N, L or H gear. Vertical view (with operator). 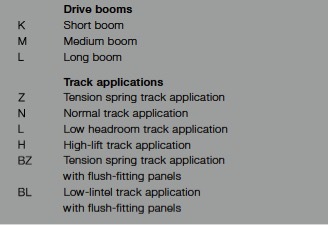 Track application Z for sectional doors under 10ft wide on Z gear. 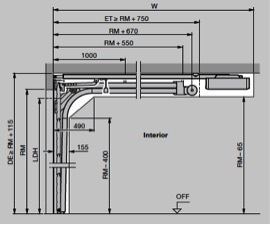 Hormann technical specification for a sectional door OVER 10ft wide. See explanation of diagram abbreviations at the bottom of page. Vertical view (with operator). Track application N for sectional doors over 10ft wide on N gear. 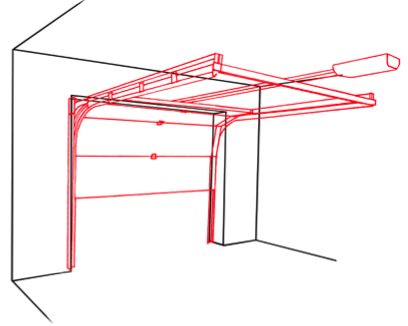 Hormann technical specification for sectional doors OVER 10ft wide on L gear. Low headroom less than 210mm. Vertical view (with operator). Track application L for sectional doors over 10ft wide on L gear. Explanation of abbreviations for all Hormann diagrams.